Everyone by now agrees social media is an innovative and powerful business tool that’s here to stay. Yet – let’s face it – you’re still confused about Twitter, Facebook and other online tools and how to actually put them to work in your business. The Manager’s Pocket Guide to Social Media offers managers a solid look at the world of social media, spelled out in clear and simple English. If you want to get started with social media and look at ways it can be used to improve internal and external communication, sell products and services and boost your productivity and effectiveness as a manager, this pocket guide is for you. 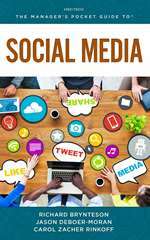 This quick-read primer covers social networking sites, blogs, file-sharing communities and everything in between to show you how social media enables productive conversations, connects people for creative collaboration and brings different worlds together to solve problems. You won’t any find screen shots, how-to’s or confusing technical jargon. What you will find are the pros and cons of social media, multiple management applications, important questions, and tips and techniques. Plus, you’ll see how some companies have successfully put social media to use and others have failed.